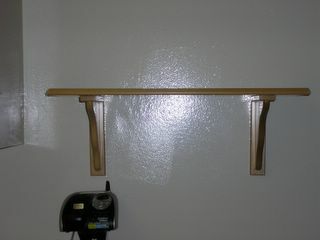 I hung shelves this morning during Amelias nap, I got to use my new drill. I also had to use mollys, and the shelf is even level! ha ha. Can you tell I"m quite proud of myself?? Ryan is practicing kicking the ball. Amelia is holding her head up pretty well now. One more picture of my smiley baby. Just kicking back in the boppy. Amelia and Steph on Mother's Day. Okay I'm just gonna take a little nap. Okay mom are we done yet? She is 3 months old now!